The bathtub surround is just about ready for tile. In fact, I think it will definitely be ready by the end of the day. I caulked all of the seams and screw holes with a flexible waterproofing construction sealant (I think it was DAP brand — I got it at Home Depot in the paint section with the caulk, and it actually said it was meant for concrete, which I thought was perfect since I was using it on cement board). 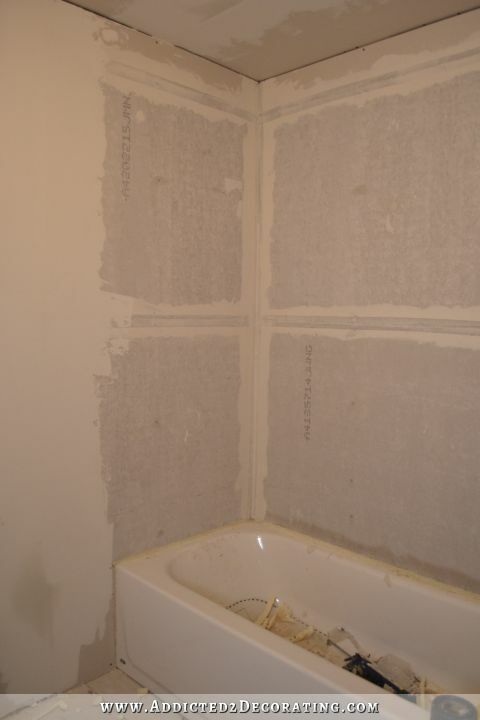 Then once that was dry, I put a layer of cement board mesh tape and mortar over the seams. Today I’ll add the waterproofing membrane. I decided to use RedGard since a few of you highly recommended it. It looks easy to apply with a brush and roller, and requires two coats that each take about two hours to dry. Once it’s dry, I’ll be ready for tile! Now one thing I learned in researching how to do all of this, and that I thought was important to pass along to you, is that when it comes to waterproofing, you either want to waterproof behind the cement board (this is generally done with a layer of thick plastic behind the cement board), or you want to waterproof on top of the cement board with a brush-on, spray-on, or roll-on membrane like RedGard. But you never want to add a waterproofing barrier on both sides of the cement board. The reason is because if water does happen to penetrate the top membrane and get behind the cement board, you want the water to be able to evaporate. 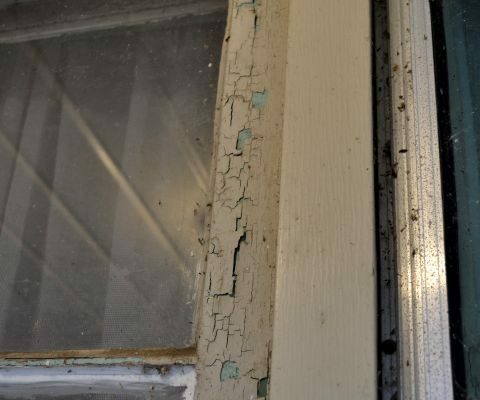 But if you’ve got a second waterproofing membrane behind the cement board, the water won’t be able to evaporate, and you’ve created the perfect environment for mold growth. So only use one waterproofing membrane, and put it either on the front or the back. So I feel like I’ve almost gotten through the boring (and hardest) parts of this bathroom remodel, and the fun stuff is about to begin. One thing I’ve been daydreaming about while working on this boring stuff is the vanity. If you’ll remember, I decided to use stock cabinets and customize them like I did in the kitchen. But I don’t want to customize them in the same way as I did the kitchen cabinets. I want it to look different, so I needed some new ideas. In searching for “furniture-style bathroom vanities” for design ideas, I narrowed it down to two different styles that I really like. That would be quite simple to do, and would also be the cheapest option. That would require quite a bit more construction/modification, as I’d have to cut the existing cabinets off above the doors, which means I’d lose the drawers. That’s not a huge loss considering that the big drawer in the middle would be non-functional anyway since that’s where the sink will be. So I’d only lose two very small drawers. I also like that the bottom area is open, which might help to keep things open and airy in such a small bathroom. So those are the two designs I’m considering right now, and I’ve gone back and forth between the two of them at least ten times this weekend. Which one would you choose for my small bathroom? Of course, regardless of the style, the color will be much different from the pictures shown above. Mine will be painted rather than stained. I still haven’t decided on the color, and I probably won’t until I find the perfect shower curtain fabric. Then I’ll go from there. For now, I just need to settle on a design. Your bod must be aching all the time with doing so much, but the bath is taking shape and I can’t wait to see finished. As for the vanity I love both of those depicted but my choice would be the second one because it is open and airy ( albeit labor intensive to construct) which is good for a small room. Having said that, will Matt be able to get wheelchair up to the sink with either of these? I am looking forward as well to seeing the tile go up 🙂 Have a blessed day. He won’t, but we decided not to worry about stuff like that with this bathroom. 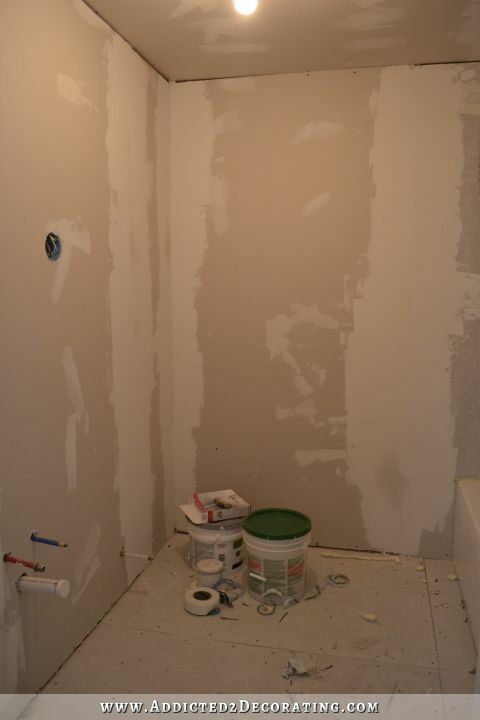 He’ll continue to use the other bathroom, which is more convenient for him, until we’re ready to do our big remodel. Then he’ll use this bathroom, but it’ll only be for a few months (hopefully). Then after that, when the new master bathroom is ready, he’ll have a completely accessible bathroom with lots of customizations just for him. i would go with the first option. I would think the second option would gather a lot of dust. However, if you need more storage space, go with option 2. I agree. I love the look of open storage, but bathrooms (well at least mine), have dust and hairspray build up, that I would make me not want to store many useful items on it. I’m about simplifying cleaning. First option – more storage. I always look for more storage. Second option would be a dust collector. I am amazed how much dust can accumulate in a bathroom even when it is a guest bathroom. I love option 2! So open and airy and fresh looking. I do love the feet in option 1 but the second option over all, while more work, seems like a winner to me. I’m sure whatever you do will be fab! I like option number 2 the best. I like number 2 best too. looking good, I would pick the second as it will give the illusion of space, which in a small area would be beneficial. But heh what ever you decide it’s the colour I’m waiting to see. I think if you are worried about the bathroom looking small I would go with the second one, but that could always backfire if there isn’t enough storage. Have you considered leaving the left and right section full length and going shorter in the middle? Almost like a desk shape but keeping the center cabinet halfway-ish so you could still use it for storage. If you like the look of the slat shelf but want to keep the option open for the space to me open you could make it removable. Maybe come up with a sturdier version of the pegs and holes the cheapy bookshelves use. Either way will look beautiful 🙂 I can’t wait to see what you decide! I like Angela’s idea for Matts convenience. Even if he won’t be using this bathroom much it would still make it easier for him. And would probably look nice too. I love this idea too. I cannot imagine a bathroom without a couple of drawers. Open for use for Matt too because when you say NEVER will use it that is a very long time!!! Trust me!! I have to agree with everyone else and say potion number 2 is the best! My mom has a kitchen base cabinet depth vanity in her bathroom and I hate it. It’s too far from the mirror. Maybe that doesn’ matter to you, though. 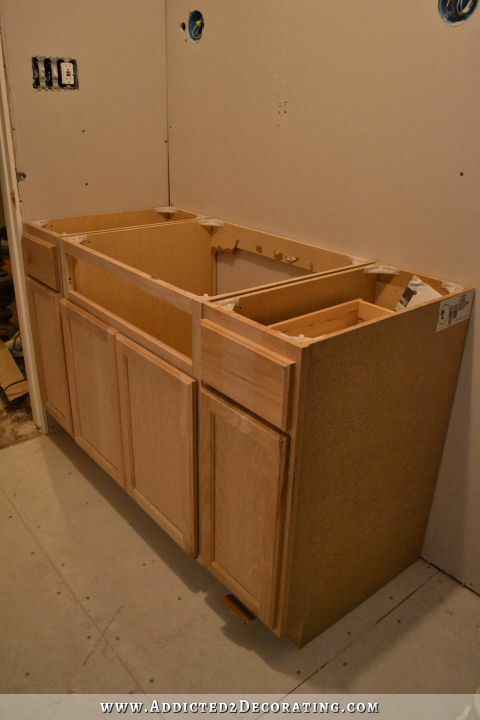 I’ll be cutting six inches off of the back of the cabinets, so they won’t be kitchen-depth cabinets. Actually love both the options! If you wanted to go with #2, could you have purchased shorter stock cabinets to begin with rather than having to cut the others down? I needed a 54-inch wide vanity, and those don’t come in the right widths. I think they only come in 30-inch and 36-inch. I like the look of option two. Would it be easier to do if you had used small upper kitchen cabinets, like the ones for on top of the fridge? Then you would not have to cut so much off the bottom just build a base..
Those don’t come in the right widths. They come in 30 and 36-inch widths, and I need a 54-inch wide vanity,so there’s no combination of those that will give me the right width. I really like Option 2 the best. I think this one being more open, looks better in a smaller bathroom. It’s also nice having that open shelf for putting fresh towels there when you have guests stay and also for guests to put their own toiletries etc on. #1 I like to hide clutter, so I’m going with the classic look of number 1. The drawers are great for organizing and storing items. i also prefer option number two because it would help keep the bathroom lighter. I don’t like the big expanse of dark brown in option number one whereas others may. 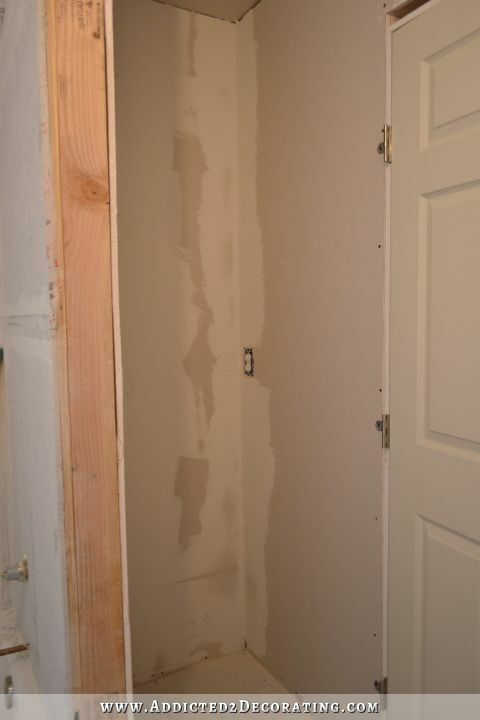 As it’s a guest bathroom/powder room you don’t need the cabinets to store much. I really love the one with the slotted bottom! It reminds me of one I am considering building when we do our major bathroom remodel. Here are the plans if you are interested. I like the option 1 because it offers more. I don’t see the point of having an open shelve that will collect dust and will allowe only few items nicely placed. We all have nick nacks and the more storage the better. I prefer the upper part of bathroom open and free of stuff than a lower part of cabinets. Both look great but I realy prefer option 1. I like them both but I think you are right that #2 would look lighter in the room. I would hate losing the drawers though. Is there a way to use a different cabinet? One of the over the refrigerator type cabinets? Then maybe you could get a drawer section and marry those 2 together. I don’t know if it’s even a possibility but if it is , YOU are the one who could make it work. Great job. I am excited to see it and glad you just gutted the whole thing! If I remember your posts correctly, the opposite wall will have open shelving above a cabinet. So, I think it makes more sense to match the open storage concept on both sides that appears in option 2. I have a similar vanity in my bathroom, and I love the fabric bins on the shelf with extra toilet paper and soap. It wouldn’t work as well if you didn’t also plan to have storage for towels elsewhere, but I think it’ll look great in your new bathroom! Kristi, you are wonder woman. It’s a considerable amount of work you’ve done! Rejoice, don’t feel guilty! For the vanities, I prefer the look of #2 for a smaller bathroom. However, I wouldn’t like the open storage where it will collect dust, hair, overspray, etc. It’s a real dustcatcher in the making. But maybe that’s just me. Either will look lovely and tasteful when you get through customizing it. boy are you doing a GREAT job!!!!!! Didn’t Miss Peeve help out this weekend? I like the second option better but the practical side of me says it will be more to clean. Having it open on the bottom will cause anything down there to collect dust and cat hair. so for that reason I choose the 1st option. On a side note: I’ve been having a lot of trouble with your site lately and I can’t figure out why. I haven’t made any changes to my computer but whenever I open up your blog my computer starts to drag! It’s so frustrating Then I’ll get some message about a script not working and I’m asked to choose either to continue, which I’ve learned freezes my computer and forces me to restart it, or to stop the script which takes my off of your page. Any idea why this might be happening or what I can do to fix it? I miss being able to follow you the way I used to. I was actually having that problem until I installed the latest update on my browser (Firefox). I love both of them and prefer the second one, however, personally I would chose the first one only because I hate dusting and cleaning, and the second one, with the open bottom and slats would be require cleaning often! A painted cabinet/vanity with the stained bottom board and legs. 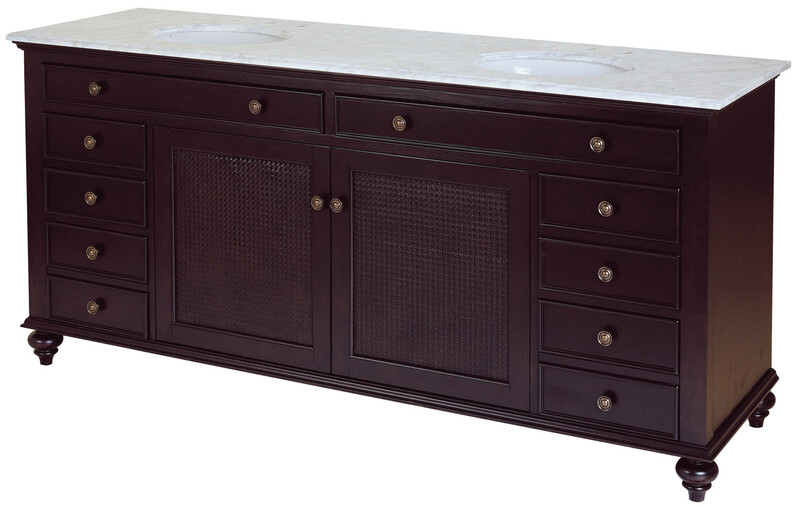 Wouldn’t that be cool with the stained countertop you plan to have? wow…i like that one! I was just going to say that I really like both, but the first one with the turned legs would look so cute in your bathroom. I hope you choose that one. And then I saw that picture – with your wood top! But in the end, choose whichever one really says to you “I really want that one”. If you know you will consistently neat and willing to wipe down the shelf on a very regular basis, than option 2 is lovely. Open shelving requires constant cleaning. Kristi, Can I give you an insider’s take on taping and mudding your inside corners where the walls meet the ceiling. 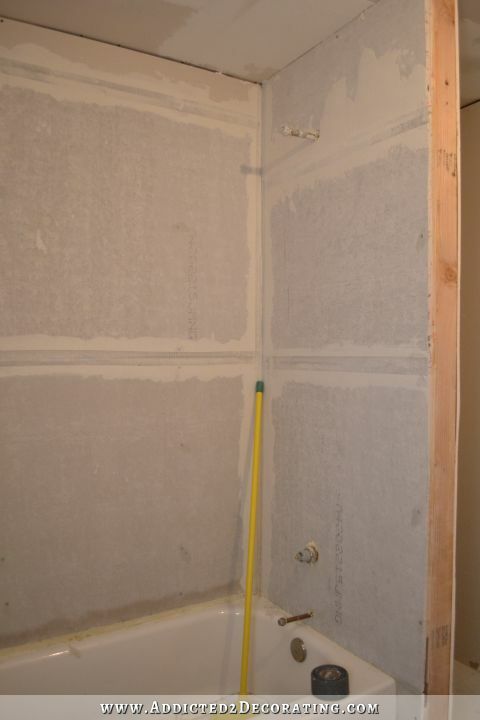 My next door neighbor (who is a talented, busy, and successful builder and all-around nice guy) revealed a secret when we asked for advice for drywalling our bath: He and his subcontractor never, ever tape inside corners anymore. They use “Big Stretch” instead. He said they’ve been doing it for years and will never, ever go back to the old way. Indeed, we tried it and it worked like a charm and was lightning fast compared to taping and mudding. Where your wall meets your ceiling would be a perfect place to practice since you are covering with crown anyway. Thanks! I looked it up, and it looks like Lowe’s carries it. I’m going to get some! My concern is the lack of storage. I’d have to go with the first option. Not only would you be loosing the drawers if you went with the 2nd option but the sink will take away additional storage space in the middle cabinet because the “non usable” drawer above would be cut off. Either way can’t wait to see what you pick. Number two. Has no one ever heard of the long handled swiffer wand-it wouldn’t 30 seconds to dust that! I’d definitely go with option 1 as I’m annoyed, too, by all that dust, hair etc. that gathers on my bathroom floor every week – and that is without any options for the dust bunnies to have a prty in open storage at the bottom 🙂 I like open storage a lot if there is room enough to display beautiful things rather than cram everything that needs to go in that room in it. But in a bathroom especially I would keep that in the higher areas. concerning the amount of storage in the vanity: wouldn’t the 2nd option reduce the space as well, as you not only lose the drawers but also a big chunk of that part where the sink will go? I like option 2! I can only imagine your cats hanging out under the second option only to pop out on someone unsuspecting and scare the bejesus out of someone! You could make the drawer functional, just cut out where you need to and then build up a box around it to alter the sides. I think YHL did something like that with their first house. I am mobile but its easy to look up.. I like option 2, especially since this is a smaller bathroom – I think it will make the room look more airy and open. Kristi, I have a question on installing the cement board. Does the board go all the way to the floor behind the tub? or stop at the tub level? It stops at tub level, and actually overlaps the lip on the tub that sits against the studs. You actually use screws and washers to attach the lip of the tub to the studs, and then the cement board overlaps that lip. First let me say that I love them both. I especially love the second one but I am in agreement with most that do not want to dust even if it only takes 30 seconds with a Swiffer as it’s one less area to worry about. However, having said that both of these are off the floor and you will have to be under them both to be vacuuming and cleaning anyway so in that respect I guess it wouldn’t be that much of an additional bother. I see somebody else included the Ana White website for her plans for that second option which I was going to post too. Can’t wait to see what you come up with as always. you are doing a great job! Personalky, I really like your second one. It feels lighter, more airy, and a better fit for a small space. no. 1 for sure, it will help keep the bathroom looking cleaner and neater and more storage for things like bathroom cleaners that we don’t to see. And besides it will be quicker and you know you have lots of other projects to get done this years. Really love your blog and all that you are able to achieve! We would enjoy the opportunity to assist you or your readers in your projects. Since you plan to have a painted vanity, it will look totally different in that space. I go for storage every time. You just can’t have too much! I think either would look great, but I would choose the first one for most of the reasons others have given. Plus, I remember you indicated open shelving will be going in that open area on the opposite wall behind the wall and I think you will still get that “look”. Did you save the old window so you can hang it on the bathroom wall as a decoration? I like option #1 for the vanity. I did save the old window, but I probably won’t use it in this bathroom. I think I’ll save all of the windows as I have them replaced and possibly make a greenhouse with them in the future. What did you decide about access to your bathtub plumbing with regards to the cabinet that you will install there? You do such great work! I have to get my “daily fix” from your page!!! My initial thought was A because of the additional storage but then I remembered you will have storage behind the door, so with that thought…..I would say B! It’s beautiful and since it’s not your Master Bathroom I don’t see hair spray and products being a problem to clean as an issue. Everything you do you do beautifully, so no matter what you choose it will be the right choice for you and Matt! I don’t care for the look of the open vanity–and then there’s dust which will be significant. Also, I don’t think it goes with the look you seem to be striving for with this house. I think the open look is more “old” you. Not to mention the work if you are going to redo. I love option number two for the openness and lighter feeling and the simple fact that it’s beautiful. I have a cabinet similar to number two in my bathroom except that I have drawers on both sides that go all the way down and it’s open in the middle with doors on top where the one you show had drawers. I don’t have much of an issue at all with dust and certainly nothing a quick swipe won’t take care of. I use mine to hold towels but it could easily hold baskets filled with toilet paper or other bathroom goodies. I wish I had have of your energy and knowledge of building, I’ve been so impressed with ALL that you have accomplished. I hope you give yourself a LOT of attagirls because you deserve them. 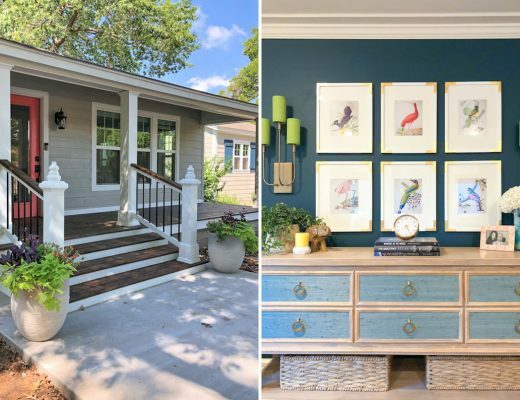 I have loved following along with your house remodel! I love both options. My first choice would be Option #2. If it were a bathroom where I was planning to do my hair on a daily basis though, I wouldn’t have it elevated at all – but that’s because of all the hair that would be hiding out underneath. As a guest bath I guess you wouldn’t have that problem, they are both beautiful options! I think you deserve an award. I’m not sure, but something LOUD and GAWDY, like me yelling “GIRL, YOU’RE ALL THAT AND A BAG OF CHIPS AND I DON’T KNOW OF ANOTHER WOMAN WHO CAN OUTWORK YOU!!!!! YAY FOR YOU!!!! As much as I love the first option (those feet! ), I think the openess of the second one would do better in a small bathroom. Those shelves also give you a little more room to add interest to the room which can be a problem in a small bathroom..
We turned a walk-in attic into a small bathroom. We considered a corner toilet to save room because we were having trouble configuring a toilet and vanity. I found the more open your “necessities” are, the more options you have to add your personal decorating touches. I like the look of both of them and could see either in you home however, I would choose the first one. One of the main reasons is because this is mostly a guest bath so it probably won’t get a lot of use, except for maybe the toilet and sink. If you store towels and things like that on that lower shelf of the second vanity, they are going to get dusty/dirty in between the time you have guests stay over. I can see your cat/cats making a bed on those towels. I also see having to keep that area cleaned/dusted and organized. While it might not take long, it is something to consider. Looking at the design you are going for in the rest of your home, I think the first option just “fits” better with your overall design. Whatever you decide, I’m sure you’ll do a beautiful job, as always! I like Option 2 the best. A.feather duster will.take care of the bottom rungs and since it is ultimately the guest bathroom, there isn’t a need for.crazy amount of storage. Kristi, as someone who doesn’t like to clean, option one would be my favorite, but I also like option two because of the shelving and getting those pretty baskets under there to store things! It’s really coming together great! Rest often, prevent injuries! I think option 1 is more timeless and practical. It saves you from the problem of what to put underneath and keeping it looking fresh under there. Two thoughts. First, I wonder if you could pull off option 2 with deep/tall over-the-fridge upper cabinets and a fake drawer panel instead of chopping up bases. Second. I like option 1 too but I think I’d find a way to put in a hidden toe kick maybe further in and painted to match the flour. I can just see tumble weeds of dust bunnies under there that you can’t reach with a broom. Especially with cats in the house. I was scrolling down to say the same thing. We need vanities for two new bathrooms right now, and I just cannot entertain the idea of these popular freestanding units. I do not enjoy cleaning on hands and knees and I shudder to think of the added work to keep stuff from collecting underneath–unless maybe if one has a Roomba? I would keep the toe kick and just add pretty, decorative feet somehow. I do really like the cane inserts in vanity #1. I’ve never seen that before and I think it would be a really pretty, unique detail to use. Option 2, (with the shelf), Rocks! I love it. What else is there to say?! I think that option #1 is prettier. The fact that it’s more storage is a bonus. Do what makes you happy. Love all the work you’ve done, and you’ll make the vanity beautiful. Both options are really nice. I do hope you’re not about to put double sinks in a small bathroom that is not a master bath. Save that for the master bath. Don’t over crowd this small room. A huge mirror will double the size of the bath. For me, I don’t need a lot of storage in the guest baths. The downstairs bath, where the spare bedrooms are, stays sparse until overnight guests are coming (because of dust, I don’t keep the towels hanging all the time). The upstairs (where my LR, Kitchen, Master and hubby and I are) has a guest bath. The two of us use that one during the day so I do keep it stocked with paper, soap and hand towels, cleaning supplies. That’s about it. I don’t need toiletries or hair products in there. So for me, no need for lots of storage of usual beauty supplies in the guest bath. Just to address the storage part of the question! As always, it’s looking great! I think either one would be fabulous. I think option #2 is unique and a departure from most of the sink bases currently in most bathrooms. 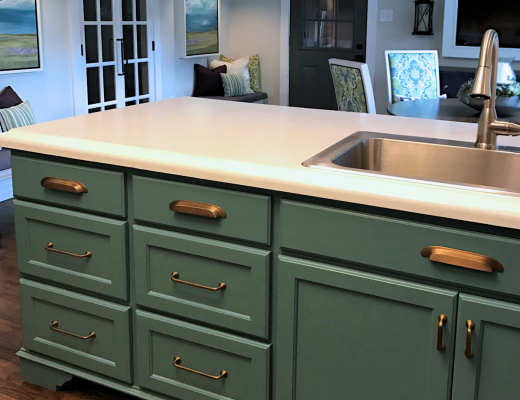 It is a look that has become more trendy and being added as an upgrade feature in new construction.. For that reason, I think it would be fun to try it in your own home, since it is a beautiful look, and since the option won’t be available in your master bathroom sink. But once you make up your mind, you will love either one I am sure! Have fun working your magic! I agree, option 2. Light and airy looking which is good in a small space. to me it all depends on the style of the room. I love the first one, it appeals to the antique side of me. The second one looks more modern. So how do you want the room to feel? I vote the 2nd option just cause I want to see how the heck you are going to pull that off. Not that I matter, but I’m in love with #1! If I had a decent sized bathroom, I would love to have one like it! I like both options. My only objection to #2, is when you cut off the drawer section, then the sink will hang down lower into the middle cabinet section and take away more storage area. 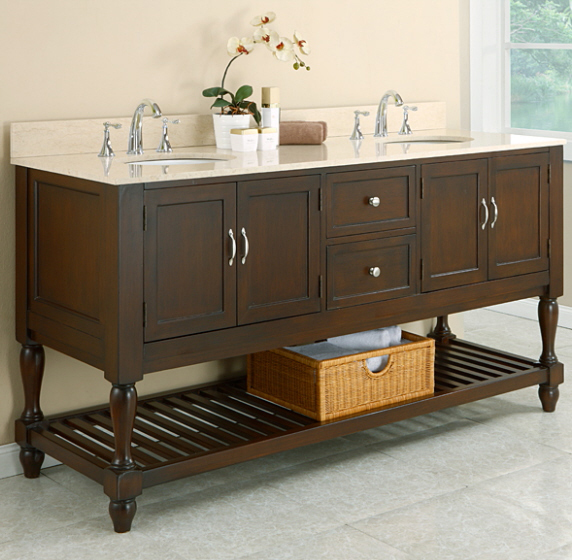 But since you will have more storage across from the vanity, then that’s probably not a big concern for you. Either design you decide on will be beautiful, because you always make beautiful things. Have a Blessed Day.